When is Restoration the Right Move? A warped Empire Strikes Back store display bell was successfully flattened to improve its appearance and then sent for grading, which prompted an interesting thread in the Star Wars Displays and Advertising group last week. 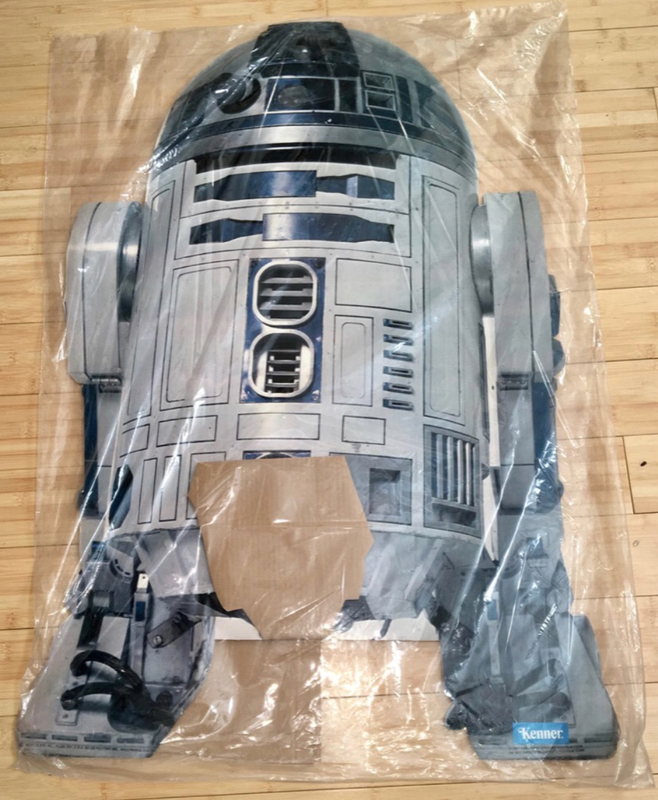 The discussion centered on when restoration is appropriate for a vintage Star Wars collectible. Topics included restoration, preservation and their impact on the value and desirability of a collectible. Different techniques for pressing a warped display were also discussed including professional paper restoration services. The general consensus among collectors is that whichever technique of restoration is used, it needs to be documented and the information passed on to future owners. Store Display: Restored or Preserved? How Significant is Grading on a Unique or Rare Pre-production Piece in a Hyper-condition Conscious Hobby? one-of-a-kind piece obviates the need for a grade. Relive the excitement of the vibrant advertising that enamored a generation of children. Joshua Buell limelights his impressive collection of vintage Star Wars store displays in a thread from the Star Wars Advertising and Displays group, featuring over a dozen early and rare displays pictured together. Before Kenner had time to create their own store displays, they repurposed the large Star Wars Standees produced by Factors, by applying a blue Kenner label to the base of each one, and shipped them to retailers. 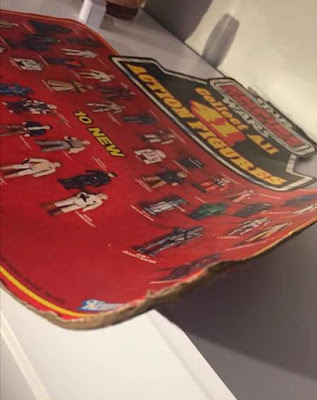 For the first time, a set of these early displays was recently found in their original Kenner shipping box. 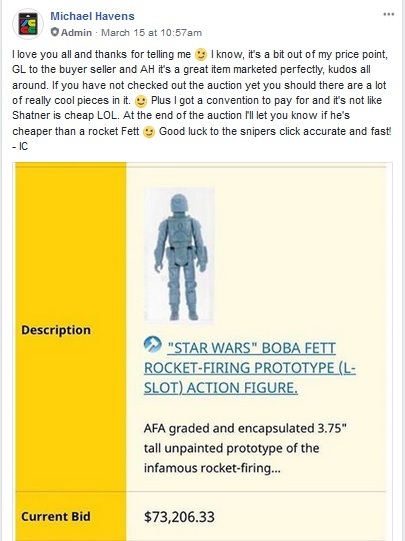 As you might recall from Issue #3 of the Star Wars Community Digest, Hake's Auction House auctioned off a rare Rocket-Firing Boba Fett prototype this week. 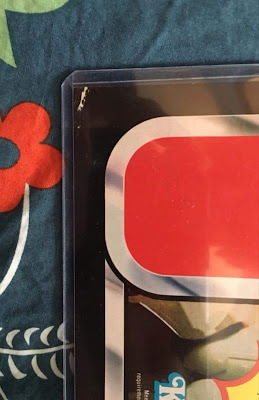 While the RocketFett has achieved a mythic status in the hobby -- despite it being far more common than just about every other type of pre-production item -- they are usually sold through private sales. As such, the entire community was glued to their screens to see what it would bring at an open and public auction. And that answer was... (drum roll please)... $86,383.47! Needless to say, it's not every day that a vintage Star Wars toy nearly tops $100,000, so the collecting community exploded with threads discussing it. As the hobby gets larger, one of the issues which comes up again and again is ethics. The community is always growing and in that growth, longtime hobby practices and standards are being forced to change. And whenever there is change and new ways of doing things, there is bound to be controversy. As such, it's always interesting when collectors try to establish where ethical lines are now being drawn and why. Such was the case in a thread in The Imperial Commissary last week. In this case, it's discussing whether or not it is ethical to sell privately through PM, rather than publicly in the sale thread itself. Hypothetical Ethics Question: Do You Have to Sell to the First Person Who Replies? Friend or Foe? Either Way, it's Delicious! As recurring readers of The Star Wars Community Digest have probably realized, we are big fans of things we've never seen before. 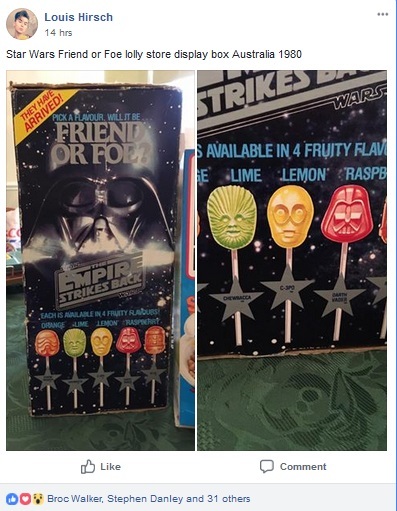 Such was the case in the Star Wars: The Empire Strikes Back Vintage Collecting Group last week, when this awesome Empire Strikes Back candy display from Australia was shared. Every now and again, there is a debate that no one remembers even happened. Such was the case with this debate from 1982. To set the stage for you, in 1982 Star Wars was not available in a recorded form, in any video format. So, fans couldn't just watch it in the comfort of their living room as many times as they wanted. The Trilogy (or the first 2 episodes of it, anyway) existed only in theaters, and fans had to go see it as many times as they could, because once it left theaters, it might not return. And after that point, it would exist only in their memory. That divorce between fandom and having 24/7 access to the basis of that fandom though, occasionally produced some rather odd results. 1. Is Vader really Luke's father? 2. Who is "The Other"? And finally 3. Is it "Clone Wars"? 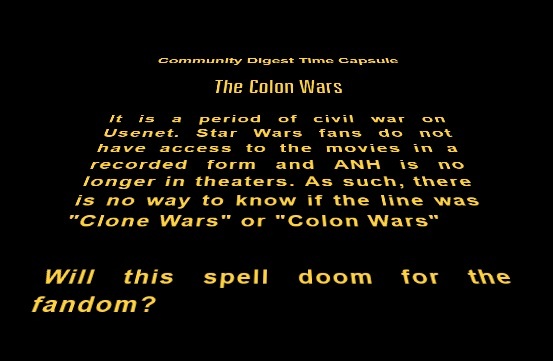 Or "Colon Wars"? Since ANH was no longer available to fans to check, the debate was apparently a real one. And because there seemed to be no other evidence of "clones" in ANH or ESB, the "Colon" version of the line was evidently gaining acceptance with some in the community. They even decided that "Colon" must be short for "Colonial," and that Obi-Wan and Luke's father must have been Colonial Soldiers. Of course, fans could have obviously just checked the script or read the novelization, but logic has never stopped a Star Wars fan for long. Here are a couple of threads from the net.sf-lovers newsgroup, which briefly discuss the debate.